This specimen is about 7cm at its widest point and it was chosen by Cat, an osteoarchaeologist who has been volunteering at the Horniman with me for the last couple of months – she’s helping me to consolidate and organise our osteology (that’s bone) collections. Do you have any idea what this might be? Feel free to make your suggestions and ask questions below – I will do my best to answer, although it may take a bit longer than usual as I have to give five Science Week talks in a row today (for the second time this week). Good luck! I’ll kick off by saying that it’s a lower jaw of something I wouldn’t like to meet in an alley at night. 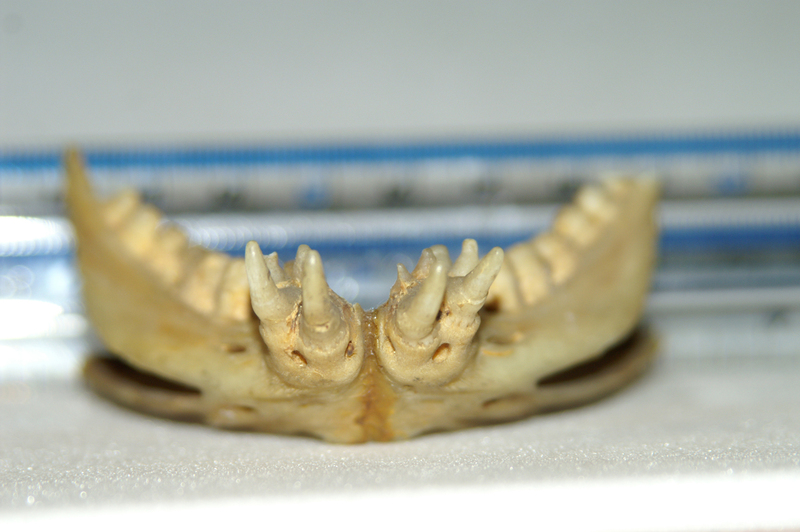 I’ll continue by saying that it’s the dentary of something, with a very large Meckel’s canal, and as I can’t see any jaw articulations, it’s not a mammal. Dentition like that dosn’t look reptilian or amphibian either, in which case it’s some mutha of a fish. Yeah, but the cut-off looks precisely the way one would expect by just separating the bones out. I still say this is a fish. But which one? Well reasoned – you are of course correct. This is a bit of a fishy object. To me it looked a hell of a lot like a placodont jaw, but seeing as it’s not a fossil I’m ruling that out. 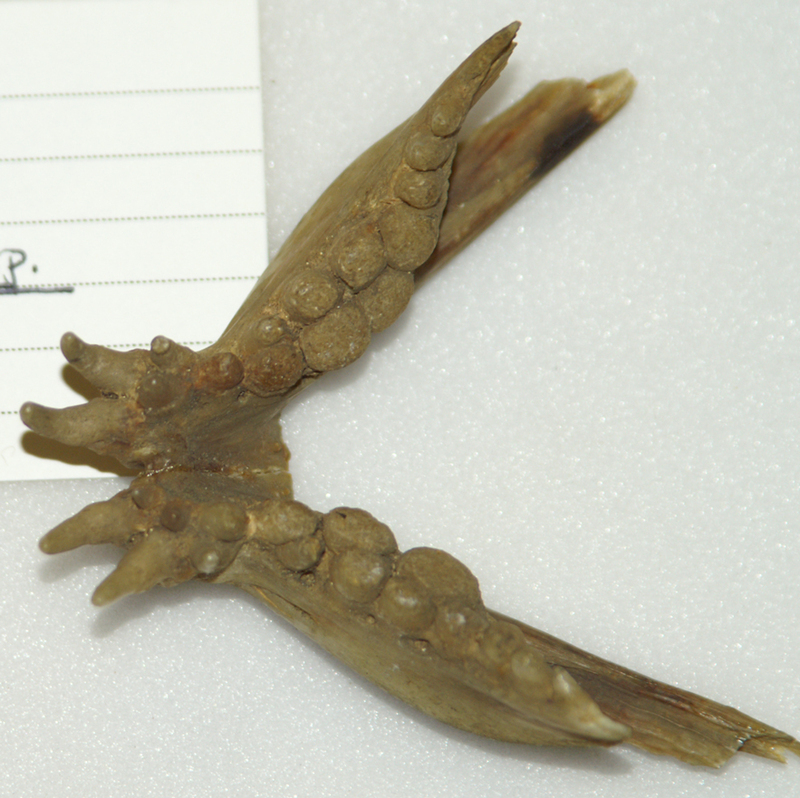 I can see where you’re coming from with the placodont jaw, but as you say, this isn’t a fossil. But is it a perciform? 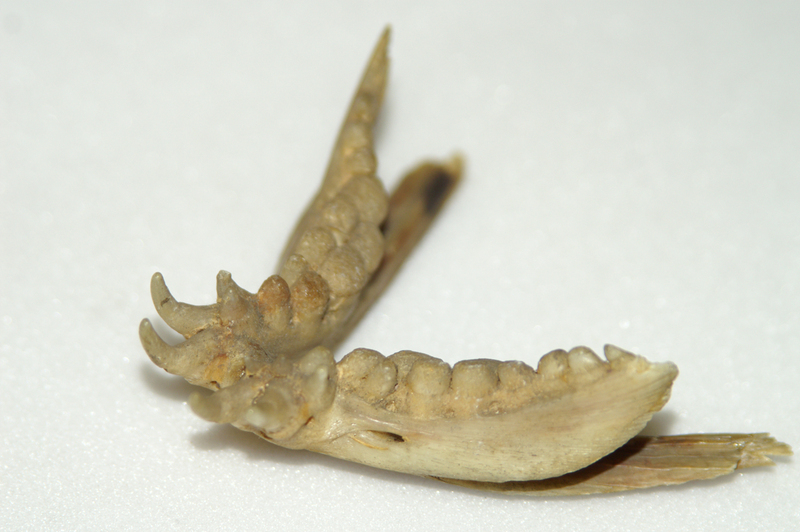 Could it be the lower jaw from some species of snapping turtle? Not a turtle – they don’t have teeth! I know what they’re from, at least, I know what their original owner looks like. Just struggling to find the damned name. Have I ever told you about how despite doing a year + of a marine biology degree (before switching to biochem/micro) I managed to miss EVERY lecture on fish? Anyway…it’s an ugly sod – perhaps a Wolf fish? Is it from the family Sparidae? Not a sparid – this is from a surprisingly big member of a different group within the perciforms. Anarhichas? That’s an impressive piece of equipment right there.